Membrane materials allow for the selective separation of gas and vapour and for ion transport. Materials research and development continues to drive improvements in the design, manufacture and integration of membrane technologies as critical components in both sustainable energy and clean industry applications. Membrane utilisation offers process simplification and intensification in industry, providing low-cost, and efficient and reliable operation, and contributing towards emissions reductions and energy security. Advanced membrane science and technology for sustainable energy and environmental applications presents a comprehensive review of membrane utilisation and integration within energy and environmental industries. Part one introduces the topic of membrane science and engineering, from the fundamentals of membrane processes and separation to membrane characterization and economic analysis. Part two focuses on membrane utilisation for carbon dioxide (CO2) capture in coal and gas power plants, including pre- and post-combustion and oxygen transport technologies. Part three reviews membranes for the petrochemical industry, with chapters covering hydrocarbon fuel, natural gas and synthesis gas processing, as well as advanced biofuels production. Part four covers membranes for alternative energy applications and energy storage, such as membrane technology for redox and lithium batteries, fuel cells and hydrogen production. Finally, part five discusses membranes utilisation in industrial and environmental applications, including microfiltration, ultrafiltration, and forward osmosis, as well as water, wastewater and nuclear power applications. 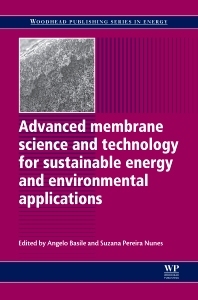 With its distinguished editors and team of expert contributors, Advanced membrane science and technology for sustainable energy and environmental applications is an essential reference for membrane and materials engineers and manufacturers, as well as researchers and academics interested in this field. Membrane and materials engineers and manufacturers, as well as researchers and academics interested in this field. This book give us beneficial information and knowledge regarding membrane separation. Dr Suzana Pereira Nunes is Principal Research Scientist at the Centre for Advanced Membranes and Porous Materials, King Abdullah University of Science and Technology, Kingdom of Saudi Arabia. The editors are renowned for their research and development of advanced membrane technologies.